Calculate calibration uncertainty quickly and easily with this Microsoft Excel calculator. 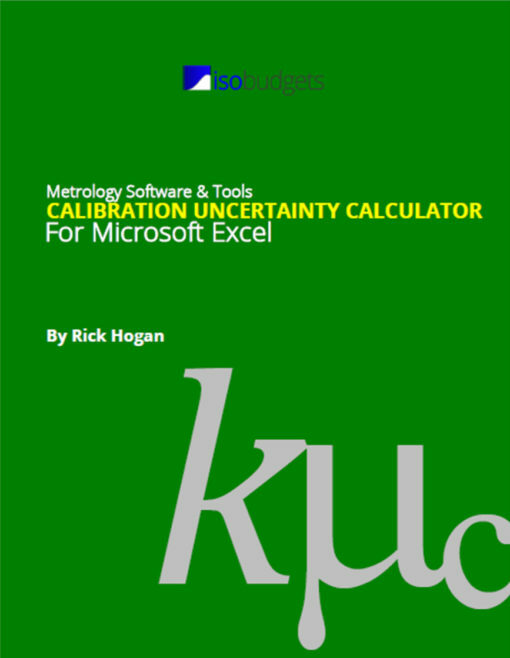 All you need to do is enter your calibration data and the CMC Uncertainty from your scope of accreditation to calculate calibration uncertainty. In accordance with ILAC P14:01/2013, you can calculate uncertainty while accounting for CMC Uncertainty, UUT Resolution and UUT Repeatability. Just enter you data into the designated cells, and the spreadsheet will do the rest. 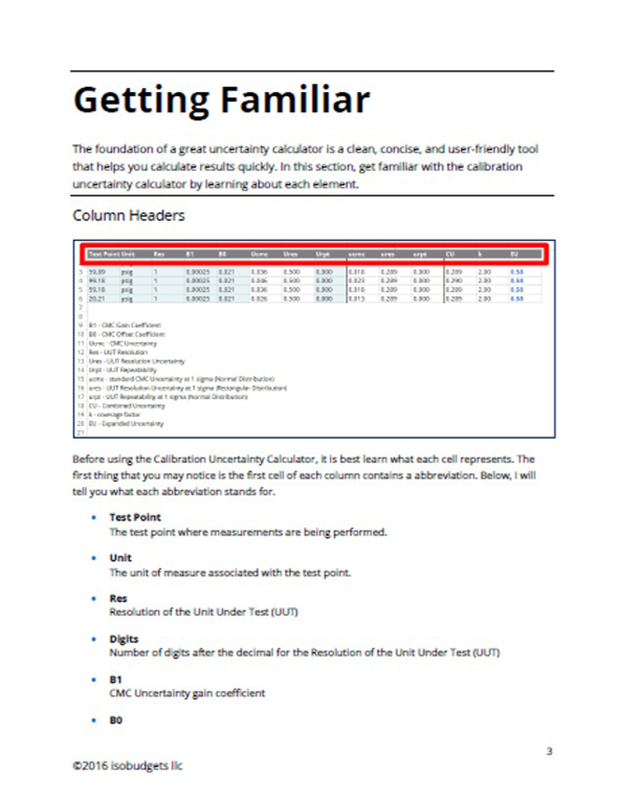 To make sure that you calculate calibration uncertainty correctly, I have included a 21 page user guide that will teach you how to use the calculator, enter your data, and format your results. 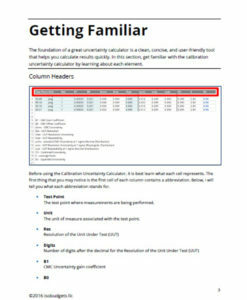 Plus, the guide includes all of the excel functions used to create the uncertainty calculator. Calculate calibration uncertainty for both analog scale and digital display devices. I have made a spreadsheet calculator for each type. 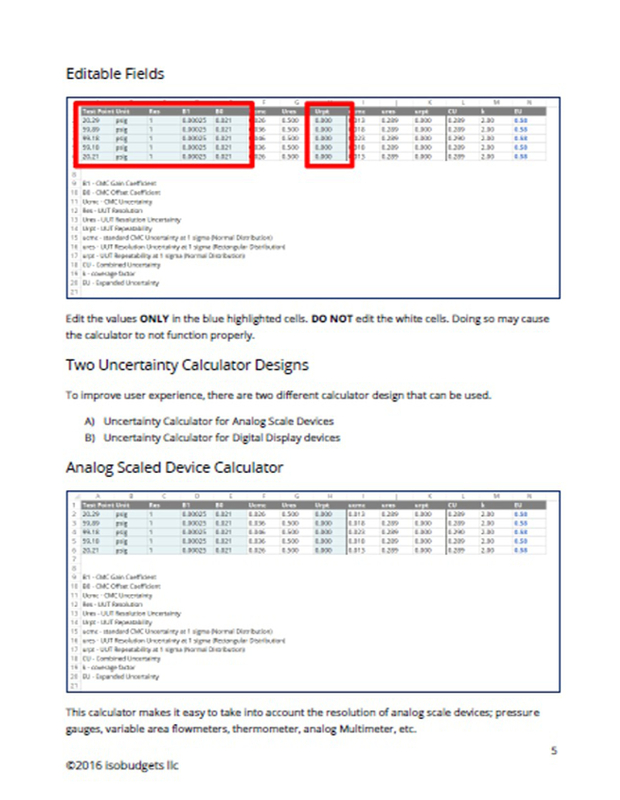 For analog devices, just enter the UUT Resolution and the calculator will already divide the value in half before reducing it to a standard deviation. For digital display devices, enter the number of digits after the decimal and the calculator will convert it to match the UUT Resolution. For example, if you are calibrating a multimeter with a 3.5 digit display or 0.0001, just enter the value of 4 and the calculator will automatically convert it to 0.0001. 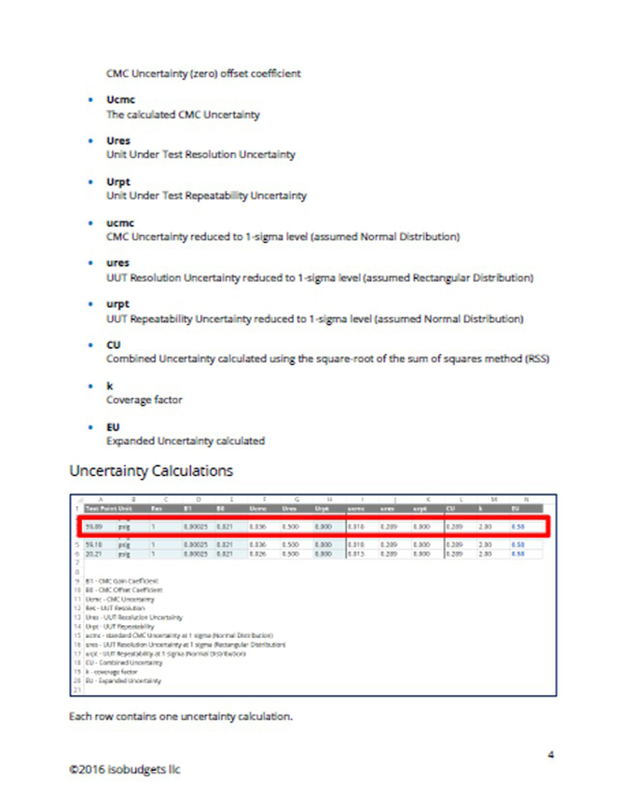 It will truly save you time, especially if you need to calculate uncertainty for a device with a lot of test points. 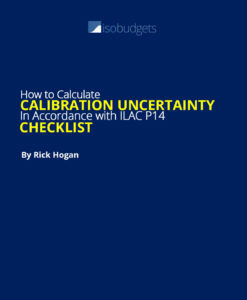 This calculator is specifically designed for calibration laboratories who are or seeking ISO/IEC 17025:2005 accreditation and need to calculate calibration uncertainty in accordance with ILAC P14:01/2013. 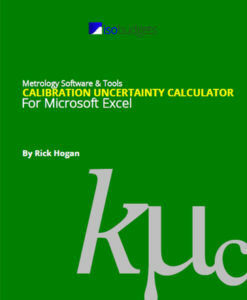 Get your calculator today to start calculating calibration uncertainty for your reports and certificates. 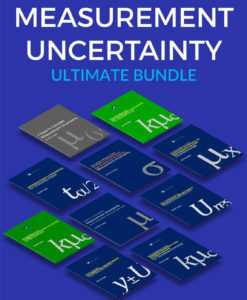 Calculate uncertainty for 100 test points in less than 5 minutes! 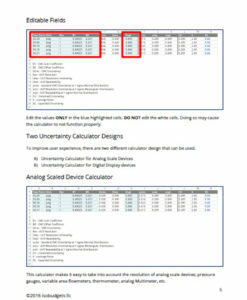 Simply copy and paste it into your calibration checklists created with Excel and start calculating uncertainty. Quickly enter your CMC Uncertainties into the designed columns, the calculator takes care of the rest. 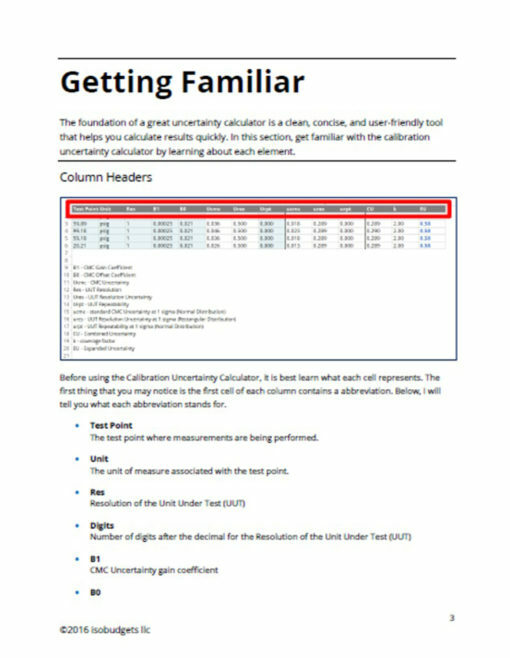 Double checking uncertainty calculations in reports is breeze with the calibration uncertainty calculator. Simply copy a single row and paste as many lines as your need. It’s really that easy! Includes back-up copy file – in case you make a BIG mistake! 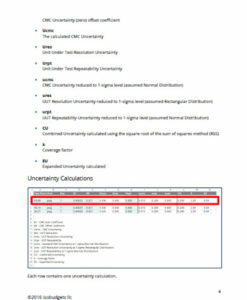 This spreadsheet will save you a lot of time designing your own uncertainty calculator spreadsheet. I liked that it was editable and as long as you understand the formulas you can change some things around to fit your calculation needs. 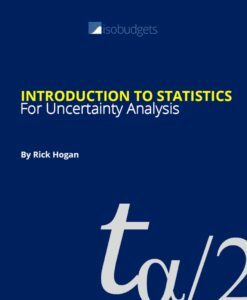 If you enjoy calculating uncertainties and want to know exactly where the numbers come from, i strongly recommend this specially for the price. It seems good and collective but I need more explanation for each parameter. The calculator comes with a detailed guide on how to use it. Did you get it with your download? 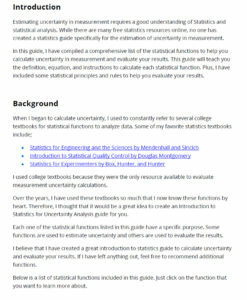 What questions do you have about using the calculator?